• Are you looking for a premium collection of high quality pencils for creating amazing art expressions? Then GET this Colore Art Pencil Pack today! COLORE Premium Art Pencil Pack is a simple yet sophisticated collection of drawing & coloring pencils every budding artist needs to have. These pencils contain professional grade quality leads that perform excellently in drawings & colorings. The exceptional blend ability & collection of colors available in each colored pencil pack, makes these pencils fun and exciting to use. 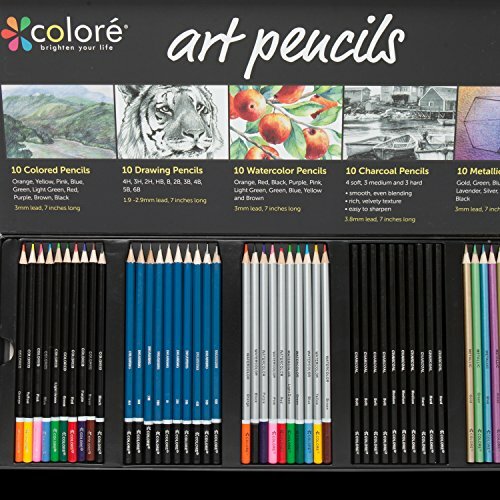 Colore Art Pencil set features a collection of painting and drawing pencils. These 5 sets of 10 different pencils with varying colors and thickness are perfect for creating sketches, painting, shading and blending components together. It is the perfect collection of pencils for creating any visual artistic concept or expression on canvas. The pack contains a collection of primary and secondary colours featuring different color intensity and pigmentation. The pro-grade quality of these pencils contributes to the production of bold, vibrant, subtle and exciting effects on canvas. Colored pencils come pre-sharpened in a way that provides an efficient alternative to waxy pencil leads that slip color outside your line. Click the ADD TO CARTbutton to buy Colore Assorted Art Pencils pack today. 50 ASSORTED PENCILS - This Premium Drawing Set consists of 10 Colored Pencils (Orange, Yellow, Pink, Blue, Green, Light Green, Red, Purple, Brown, Black), 10 Watercolor Pencils (Orange, Red, Black, Purple, Pink, Light Green, Green, Blue, Yellow, Brown), 10 Drawing Pencils (4H,3H,2H,HB,B,2B,3B,4B,5B,6B), 10 Metallic Color Pencil (Gold, Green, Blue, Violet, Olive, Lavender, Silver, Indigo, Brown, Black) and 10 Charcoal Pencils (4 soft, 3 medium, 3 hard). PERFECT EDUCATIONAL GIFTS: Your boys and girls will love this coloring and drawing kit for their school supplies, whether it's for coloring their superhero coloring books or simply just sketching and drawing on their sketch pad and paper. Get one for your grown up best friend for coloring their favorite secret garden coloring books. Great gifts for Christmas, Thanksgiving, Easter, Birthday, New Year or Graduation. All Pencils are Lightweight, Durable, Portable and Offer extremely easy handling. DOUBLE THE FUN - Coloring can never be more fun with these coloring sets for your toddlers or older kids with their sleek and natural wooden look. A great addition to your teens art and craft collection. Each color pencil has smooth & creamy texture with a strong thick core guaranteeing high quality results when used. All Pencils are luxuriously packaged in a flip-top set & plastic tray to keep pencils perfectly organized for easy storage or use on the go! SATISFACTION GUARANTEE - All of Colore Brand products are covered by No Hassle Money Back & Satisfaction Guarantee, ensuring that you have a great buying experience with us. We are so confident that you'll love your art pencils that we're giving you a Lifetime Guarantee. Get yours NOW! If you have any questions about this product by Colore, contact us by completing and submitting the form below. If you are looking for a specif part number, please include it with your message.